MENA countries are no stranger to hot weather. With some of the highest recorded temperatures, the Middle Eastern and North African countries are some of the hottest places on earth. And if you stay in one of these countries, you will know how unbearable the heat can get. Especially during the summer months, the temperatures of our countries become so high, that many of us look for a peaceful vacation away from this heat. And if you are searching for a beautiful destination to take a break from the heat, consider visiting Anguilla for a seaside vacation. Situated in the northern side of Leeward Island, Anguilla is British overseas territory in the West Indies in the Caribbean. Surrounded by the Caribbean Sea and the Atlantic Ocean this place offers white powdery sand, crystal clean water, and a welcoming attitude. Romantic getaways in the beach are one of the main attractions of an Anguilla vacation. 16 miles long by 3 miles wide, this pretty small island offers one of the romantic beaches in the entire Caribbean. Despite its small size the entire island is filled with exciting places and plenty of things to do while you’re there. Places like Shoal Bay, Meads Bay or Sandy Island will make your vacation in Anguilla more romantic and worthwhile. Here you can get down to calypso music while sunbathing on the beaches. Swim with the dolphins and after lunch, you can visit some pretty old Roman Catholic Churches. With some traditional seafood and open-air barbecue and home of the most amazing wine collector, Anguilla is one of the food paradises on earth. A large part of Anguilla’s attraction is about the food experience. From Sandy Ground to sunset at Crocus Bay here are top 8 reasons why you should visit Anguilla. Shoal Bay is named one of the “The world’s best beach”. While there are so many beaches (almost 33 beaches) in entire Anguilla but this beach is home to some of the brilliant beach bars, turquoise seas, coral reef and a perfect place for scuba diving at the heart of the underwater world and glass bottom boat tours are the main attractions of Shoal Bay. It’s a perfect place for sunset strolls and nice swimming. There are other remarkable bays such as Munday’s Bay, Meads Bay. Surrounded by soft powdery white sand and warm ocean water Rendezvous Bay Beach is one of the picturesque places in Anguilla. 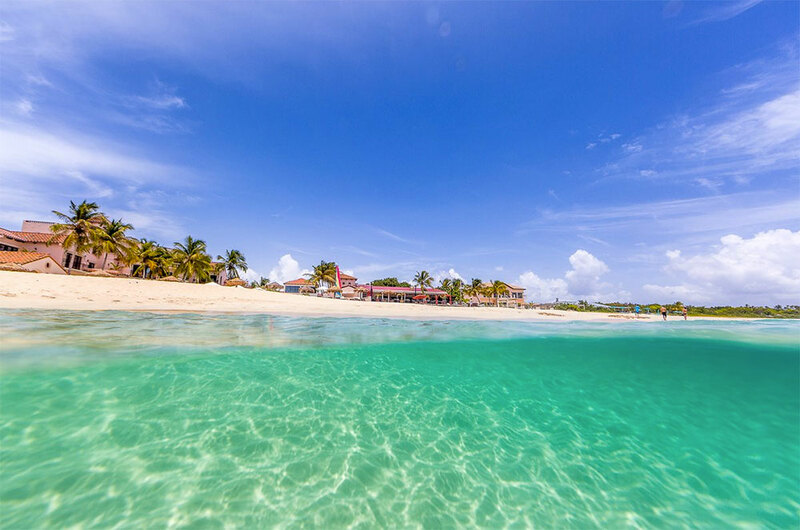 With a great view of St. Martin, this long stretch beach offers plenty of beachside bars. The water here is a little bit choppy but the warm sun will give you the best filling in the entire world. While you’re at Rendezvous Bay Beach to get a glimpse of Anguilla’s food experience, Sunshine Shack is the best choice for you. Perfect choice for a romantic getaway. If you’re looking for the “the entertainment capital of Anguilla” Sandy Ground is a place to be. By day it’s a sleepy clam village and at night is a home of the most imaginative beach bars and entertainment centres. At night the entire village transforms into this happy place where everyone just wants to be themselves. Whether you came down to just hang out or dance your blues away, Sandy Ground will welcome you with its warm hands. Also, by day, this place showcases the salt economy that was once situated in Sandy Ground. At night the smooth Caribbean music will take you to an entirely different cosmos. The old valley is situated on the road to Crocus Hill, this area of the town is most architectural examples that boasts about Anguilla’s glorious past. Buildings like Ebenezer’s Methodist Church, Miss Marjorie’s House, The Warden’s Place, Rose Cottage reminds us of the rich and cultural part of Anguilla’s. Situated near the north coast of Anguilla. Sandy Island is a private island in the middle of the ocean, in the middle of nowhere surrounded by clear Caribbean water. With a variety of seafood that’s available on the venue and cold beers, this island is a natural wonder. The view is spectacular. That view will freshen up your mood as you walk down the strip for a food walk. The island is lined with small shacks and stalls where you can taste the local BBQ. Looking for best snorkelling experiences in the Caribbean? Little bay is the best place for you. 30 meters stretch of sand, surrounded by two huge cliffs, Little bay is filled with fishes, turtles, squid, shells and other exotic sea plants. It’s one of the private beaches in Anguilla. It’s famous for its Beautiful blue waters and great island scenery. That blue water is as transparent as your soul and is a great reminder of good times. Anguilla has a lot of boat tours to offer. Places like Sun kiss Adventure Living, Tradition Sailing Charters, Sea Pro Charters, Calypso Charters Anguilla and many more provide boat ride and other adventurous trips around the island. All staffs are friendly and lively. They greet you with a warm smile making your trip worthwhile throughout the time while you’re on the boat. Other adventures include flyboarding out at sea, Hydro-Flight Activity and many more. You can also get SUP rentals where you can take for a spin on your own and have a small tour of this small island. In the Valley Road among the old architectural masterpieces. St. Gerard Roman Catholic Church is one of them. If you’re Religious or Atheist it doesn’t matter this place should be visited for its calmness and the Special Palm Sunday. St. Gerard Roman Catholic Church is one of the historical churches in Anguilla and its meaningful service still provides who seek help in their faith. Among Other churches, Bethel Methodist Church is also a nice place to visit. Anguilla‎ is a hidden gem of the Caribbean. And it should stay as a hidden place. Far from the hustle bustle of the city, this place provides a calmness that is as pure and clear as the Caribbean water. Ignoring the red eye of many hurricanes, Anguilla still survives because of the people who provide millions of services throughout the entire island. Its wonderful scenic view of the far stretched ocean and white sand will stay in your mind for an eternal time or till your grave. Visit for a unique experience and stay for you are yet to discover the marvels of this underrated vacation spot.